Thinking about the beautiful days we are having and the joy of being surrounded by friends, eating and laughing and talking and crying… all that is missing is good food. When the weather begins to warm up, I picture salads of all kinds and colors and tastes. Perhaps more than any other food, salads are the typical Israeli dish. The evening meal is often a variety of salads consisting of many vegetables, grains and fruits. The most typical salad – and an accompaniment for most all meals – is the Israeli Salad. We made bowls of it for breakfast, lunch and supper for the hungry kibbutzniks who piled their plates with this salad. Little dishes of many tastes is very middle eastern. It is fun to create various salads, many tastes and highlight the wonderful produce that is part of this season. There are few other sights in Israel or the world that can compete with the color and clamor of their fruit and vegetable markets. The produce tastes as good as it looks! Cut all vegetable into small pieces or cubes Add 1 tablespoon vegetable or olive oil, juice of 1 lemon, salt and pepper. Mix well and pour over vegetables. Great on the side of fish, chicken or with other salads! And what salad table in Israel would be complete without hummus? Make your own easily! Enjoy these tastes from Israel and surprise family and friends with a table full of healthy and fresh salads to accompany any other foods or as a meal itself. Summertime means salads! Start early mastering your favorites! Photo by 2-Dog-Farm. Used under Creative Commons License. This was my favorite dinner that my mother would make when I was growing up. I have not eaten it in many years – not since I began keeping kosher and forsook all that combined milk and meat. Intellectually, I have problems with the dictum that milk and meat should apply to poultry at all: the commandment tells us to “not seethe a kid in its mother’s milk.” The logic goes that to do so – to literally boil the slaughtered flesh of a premature lamb in the substance it’s mother’s body excretes with the intent to nourish it –would be cruel. I can see their point. But chickens produce no milk. 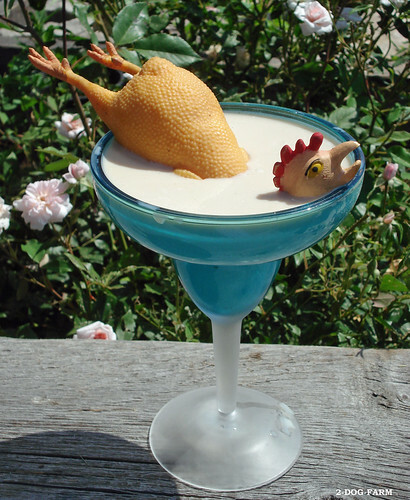 They do produce eggs in abundance, but there is no similar prohibition against dipping butchered fowl in a yolky-albumen cocktail of its never-to-be-born offspring. Such are the vagaries of kashrut. There is, of course, a lengthy chain of Talmudic logic that gets you from cheeseburgers to chicken parm. I will not trouble you with it here. It is a logic I begrudgingly accept as an article of faith, in part because the logic is so extended and because I doubt faith supported by less serpentine logic would qualify as faith at-all. My mother claims that the detail of the cheese on top of the chicken is an invented memory, belonging only to me. Technically, she is correct that traditional Chicken Marsala is prepared without cheese. But if we were to get technical then I would be compelled to note that nowhere in my mother’s recipe does the ingredient Marsala wine appear. And come to think of it, I don’t remember any mushrooms either. That detail doesn’t jibe with a dish that was imprinted on my psyche at an age when I was most certainly not yet reconciled to the view of fungi as fit for human consumption. And looking at the recipe, there is no reason I couldn’t make this dish now and stay within the bounds of kashrut by simply withholding the (possibly fantastical) cheese. And perhaps some day I will. But I am already bracing myself for the letdown when, inevitably, the alchemy of this childhood dish fails to reactivate. Even if the cheese is a pure fabrication, it stands in-place for the one-way passage that delivers us from childhood and the comforts thereof. I can no more be the little boy licking his plate clean than I can convince the Sanhedrin that dairy and poultry really is kosher. Would that I could do either. Well folks we just learned that it is National Noodle Month and to honor it we are sharing a favorite noodle recipe with you. We figure it must have been a Jew who created this special month since it is just at the time we are clearing out our chametz for Passover. Enjoy this and feel you are doing your part to celebrate the noodle and also to prepare the house for the upcoming holiday. Add the noodle mixture to the hot pan and bake at 350 (lower the oven) until golden and crisp on top ½ hour to 45 minutes or however long it takes. Enjoy hot or room temperature or cold the next day.